The renowned Donoghue's of Galway celebrated 50 years in business in 2016 while it's a busy time for Managing Director Joe Donoghue who is double jobbing as chairman of The Coach Tourism & Transport Council of Ireland (CTTC). Established in 1966, Donoghue’s of Galway is a family owned and operated business. They operate a fleet of modern deluxe coaches which are all Failte Ireland approved to 4* and 5* specifications. The fleet has coaches of varying seating capacity ranging from 8 to 53 seats which are available to hire for all types of events and occasions. Donoghue’s of Galway also provide a chauffeured limousine service specialising in airport transfers, business, weddings and leisure travel. With over five decades of experience in the industry, Donoghue’s of Galway aim to provide their customers with a professional, first class service and can assist them not only in their transport requirements but also in the preparation of their itinerary to include accommodation, day tours, sightseeing and much more. “For any company to reach the 50 year mark in the current climate, especially the last few years, it's a fine achievement,”remarked Managing Director Joe Donoghue who puts their longevity down to 'hard work'. “Initially, when the recession hit we had to diversify. We looked at all our options and invested a lot of money in our fleet to bring it up to corporate spec. A lot of companies were investing in Galway and we felt there was no transport company in the county catering for the corporate market or that was able to provide the 5* spec they required when bringing in potential clients. We saw this as a niche in the market place so we developed this. Drivers and staff play a huge part in how Donoghue's deal with clients and the service they provide while Joe speaks from 20 years experience as a tour driver. He holds a Failte Ireland National guide badge and has worked with most of the large tour operators including Abbey Tours, CIE International Tours, Celtic Tours and Shrine Tours to name but a few. His curriculum vitae made him a perfect fit to the role of chairman of the CTTC when it came up for grabs two years ago. The Coach Tourism & Transport Council of Ireland (CTTC) is the representative body for Ireland's coach touring companies, and Ireland's private bus operators and they promote Ireland's top independent coach hire operators. Their members are experts in all types of coach hire and transport solutions including: airport transfers, day tours, extended touring, incentive travel, golf tours, school transport and scheduled services. “I'm in my second year as Chairman of the CTTC and while it's most definitely a challenging job, it's an enjoyable one as well. “The biggest problem facing our members at this point of time is lack of drivers, rising fuel costs and cost of insurance. We are trying to highlight this with Government representatives, especially the current Minister for Transport (Shane Ross), but unfortunately we have been unable to secure a meeting with him to date. On a more positive note, the highlight of Joe's term as chairman was the bi-annual Coach and Bus Show which attracted a full house at the RDS Simmonscourt over the weekend of November 12/13. The Gala Dinner took place in the Ballsbridge Hotel on the Saturday evening. Joe and the team at Donoghue's, which includes his wife Marie and son Dylan, who is studying transport management in LIT, added a Volvo 7900 to their already comprehensive fleet this year and two corporate smaller coaches. “It has been our policy to add two new vehicles every year to our fleet and this year was no exception adding 3, to mark our 50th anniversary,”he explained. 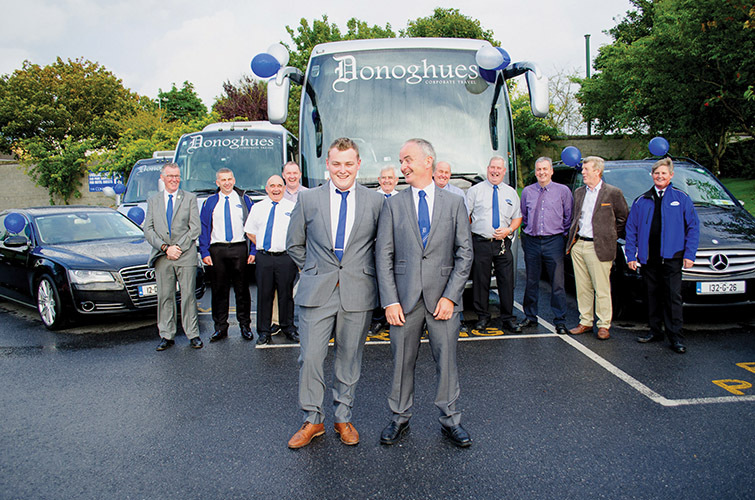 Donoghue's of Galway have 23 qualified professional drivers on their books and their depot, which is situated in Clarenbridge, has a fully operational garage staffed with 2 mechanics responsible for the constant meticulous maintenance of all the coaches. They operate a fleet of modern deluxe Failte Ireland 4 & 5 star approved coaches of varying seating capacity ranging from 8-53 and offer facilities such as air conditioning, toilet/dvd, fridge, tables, WiFi and charging ports for laptops. All coaches are fitted with seat belts for your comfort and safety. The ever burgeoning bus and coach provider supply their customers with a professional, reliable and personal service they can trust. They pride themselves on listening to you the customer for your comments and ways in which they can improve and provide you with the best service possible.